Every day during my school years at St. Vincent's College, Potts Point I was required to 'pay a visit' to the College Chapel. Woe betide any student who did not stop and make that visit on the way into school each morning. The nuns had spies somewhere who were able to identify those students who had forgotten this most important visit and there was punishment awaiting. Being a dutiful girl who was scared of the consequences that might arise from a non-visit I always dropped by to say hello to God. I am choosing the Chapel as my place of worship for this Carnival of Genealogy as it is the place of worship with which I am most familiar. 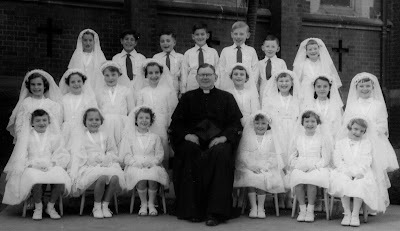 It was the venue for my First Holy Communion and the place where I was sent with my classmates to confess our sins on a regular basis. 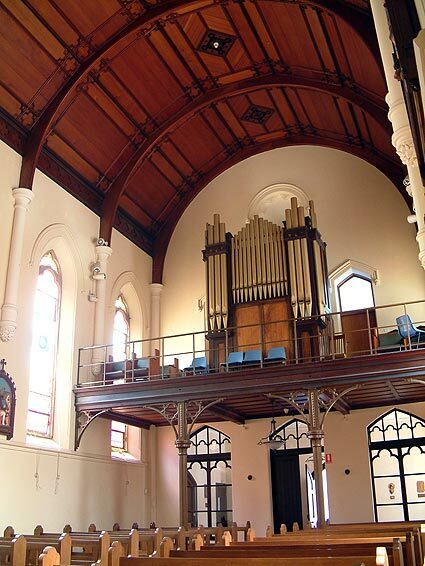 A description on the College website states: "The beautifully proportioned Neo-Gothic St Vincent's Chapel, Potts Point was solemnly dedicated on the 10th February 1902. 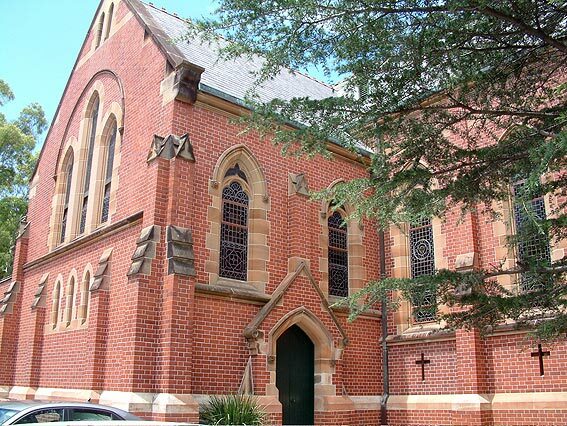 While modelled on the chapel in Dublin of the Irish Sisters of Charity, it relates beautifully to its own Australian context through the use of local red brick and its sandstone trim. Many of the exquisite stained glass windows were gifted to the Chapel by students and ex-students of St Vincent's College. There are many examples of Carrara marble statues which still grace the chapel today. The parquetry floor provides an interesting story that reveals the importance of this chapel in the period of the Second World War as it was paid for by American forces situated locally who needed altar breads." I remember singing many hymns such as "Come Holy Ghost", "Hail Queen of Heaven" and "Faith of our Fathers" to the accompaniment of the Chapel Organ during the many Benediction services we attended there. I would like to have been married in that chapel rather than my parish church but the Sisters of Charity had not woken up the the commercial possibilities of hiring it out as a wedding chapel at that time. My younger cousin, also an ex-student, was married there; it is a beautiful venue for a wedding. A Sydney Wedding site describes the Chapel: "The Chapel at St Vincent's College in Potts Point is a lovely wedding venue. It is an old style chapel with a high ceiling and lovely interior features. There is a loft area for an aerial view and also an outdoor area large enough for mingling and group shots.". Although I may appear a trifle cynical I loved that Chapel. It was a pretty, peaceful place that was a constant in the lives of we growing girls. It was somewhere I visited regularly from age 5 until 16. Tinker, Tailor, Soldier, Spy. 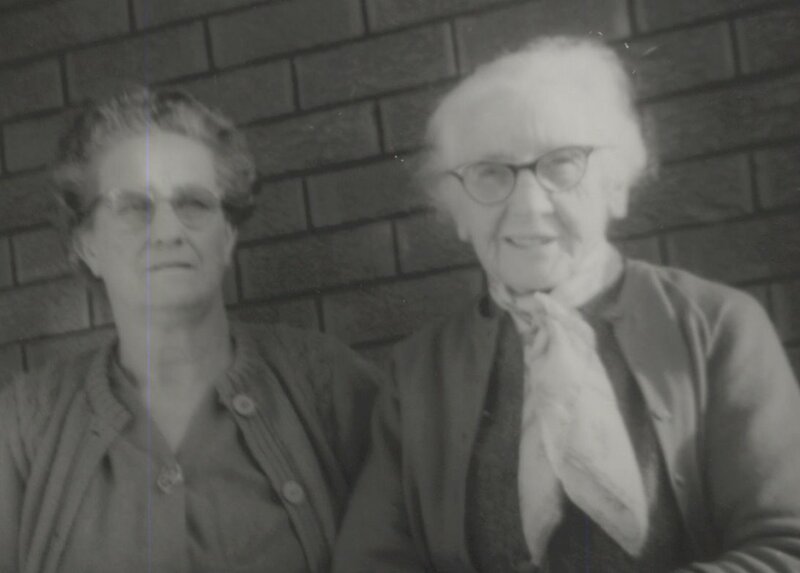 What sort of genealogist am I? Randy Seaver's latest edition of Saturday Night Fun reminded me of a post that I wanted to go back and read. Because I forgot to star it in my RSS reader I had trouble finding it. Thanks to Randy for directing me to The Stardust and Roots Blog where I found "Sears Catalog of Genealogists". In this humourous post Bart Brenner categorises genealogists. I had a few chuckles as I read through the post and worked out where I and my GeniMates belonged. I encourage other genies to read, enjoy and reflect on this post. I imagine that others would share the difficulty I had in filing myself neatly into one of Bart's boxes. I am affected by the environment and my moods so my approach on a particular day will vary according to these influences. I am significantly a Steve Jobs model with a big touch of Margaret Mead. My messy overcrowded house indicates I have a strong dose of Ambrose Monk in my makeup. , six months ago in which I asked where should I post my comments on blog posts drew some excellent comments. As a result I developed a personal policy that I would post my comments directly on the blog in question. In the light of recent developments in the social media arena with the introduction of Google+ and the +1 Button I am reflecting on my dilemma and thinking about my policy on linking to (promoting) my blog posts and commenting on posts written by others. I am aggravated when people with multiple online personalities tweet the same link in quick succession via two or more accounts, I see this as a form of spam. 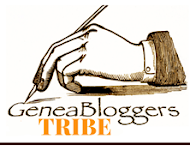 I will continue to tweet only as Geniaus and only tweet links to my blog posts once. Only in exceptional cases will I use Facebook to post links to Geniaus blogposts. I will use the GeniMates Facebook page to announce to its fans when new profiles are added to the GeniMates blog. As many of my genealogy contacts are now on Google+ I will use that platform to promote my new blog posts. I choose this in preference to Facebook because I can easily target my posts to my Genealogy Circle and not clog up the streams of people in my other circles. I try to comment on a few blog posts each day. Everyone enjoysa bit of positive reinforcement. As I believe that blogging is a a two-way street , a medium for online conversations, it is important to connect with those who have gone to the trouble of sharing their experiences and knowledge with me. The number of comments I make each day is dependent on the quantity, quality and relevance to me of the blog posts that day. As a result of the responses I had from bloggers to my initial dilemma post I will continue to comment directly on a blog. By commenting there I can add to the conversation the blog posts have evoked. If I were to only comment on Twitter, Facebook or Google+ about the posts those comments would stand alone and out of context from the original post. I will use the +1 button on Google+ to notify my mates on Google+ of blog posts I find interesting. I do not need to complete a weekly 'best-of' as the +1's on my Google profile do that for me. I will use the share option on Google+ to tell others about those posts I find particularly noteworthy. When findling links to blog posts on Twitter I will continue to retweet those I have found interesting or noteworthy and perhaps add a short comment to the retweet. The majority of the notifications I have come via my RSS feed. I mostly read these on my Android tablet which gives me an option to easily share via a number of platforms. I select the most appropriate for each post I wish to share. I wonder what preferences or policies other genealogists have for giving and receiving blog comments. My first visit to the New York Public Library in search of ancestors. For most of this century I have been using Dreamweaver to develop my websites. I had previously used the Microsoft product whose name I can't remember. Today I tuned into an Explorinar with Thomas MacEntee of High Definition Genealogy on the use of Weebly. In less than half an hour I have put together this simple website using the free Weebly website creator. I look forward to further exploring the Weebly tool to enhance my site. At the moment I haven't personalised the site with my own images etc but give me another hour or two and it will take on its own personality. I have recently purchased a new laptop and have been going through the tiresome task of loading my software onto it. I am now going to experiment with Weebly and, if I can incorporate my other webpages into my Weebly site then I may not even load Dreamweaver onto this new machine. For someone who would like to have a website but doesn't know how Weebly provides a simple WYSIWYG drag and drop interface. It's really child's play - as Thomas related it is being used widely in schools for students to create webpages. As for today's explorinar with Thomas, he once again did a great job. He ably demonstrated the features of Weebly while interacting with participants who posted questions on the chatboard. I like his style of teaching in which he responds to questions as they arise. Thomas' personable approach made me feel as though I was in the room with him not on the other side of the world. Thanks, Thomas, for an excellent learning experience. Our English cousin with whom we spent a few days this month takes a different approach to family history from me. A bowerbird and collector he collects things relate to his ancestors. His collection ranges from bibles to family silver to letters and postcards to a grandfather clock to paintings, portraits and poetry books. He generously gave us a few treasures to bring home. Unfortunately we had to leave two large items, a portrait and a framed photograph behind as they were too big to fit in a suitcase and we were not sure about whether we would need to get the timber frames and backing fumigated on our entry to Australia. They have been wrapped and put away for our next visit. In the interim we will see what the quarantine laws require us to with them to bring them into Australia. I was quite taken by a book written by one of his ancestors, Rev. Henry Brierley, The Rochdale Reminiscences written in 1923. Although Brierley is not one of our family lines our Ball line hails from Rochdale. I started reading this little book after breakfast one morning and found it fascinating. In the 30 odd pages I read there were references to places I knew from my research and to a number of the Ball family names, the content of this little old book put me in the time and place of our ancestors. Our cousin who could see how taken I was with the book asked if I would like a copy. I replied in the affirmative. I am so grateful that this charming collector cousin was willing to part with one of the five copies of the book he had collected over the years! friendship I live with them still in very happy memory. like to that which I had in writing it. There was so much pleasure for me between the covers of this modest little tome. I spent quite a bit of time drooling over the books for sale on the shelves at the Bookshop in The National Archives at Kew. Unfortunately because I only had a 23kg weight limit on my luggage from London to Europe I was unable to buy some of the weighty tomes that piqued my interest. If I had known then that the Sofitel at Heathrow where we were to stay had a bag minding facility my bags back to Australia would have been heavier and my wallet lighter. I did sport myself a TNA notepad and pencil (I'm an old kid) as souvenirs as well as three little books from the summer sale. At just £2.99 I couldn't go past them. The Family History Companion is an A-Z guide that provides tips for researchers, meanings of terms used in genealogy and short articles on things like the Hearth Tax and Parish Registers. Family History in the Genes was published 4 years ago so is a bit out of date but for someone like me, who is scientifically illiterate, it is a useful little reference book. This title must have sold out as I cannot now find it on the bookshop site. I have yet to read Family History in the Wars by Military Specialist, William Spencer. It looks as though it will give a useful overview of the conflicts in which Britain has taken part from 1899 to 1953 and the related military records that are available for genealogists to use. I am sorry that I did not also purchase Easy Family History. I rejected this title because it was a beginner's guide - I should not have done so because I am sure that I would have learnt something from this little book that is still available online and in the bookshop. I wanted to write about my visit to a mobile library in a small village in Wiltshire, England, last week but it isn't really relevant to a genealogy blog. I woke this morning at 4:00 am and was pondering this when I reflected on my visits to mobile libraries 50+ years ago. A mobile library post is relevant because it is part of my family story. Last week we stayed with a cousin found through Genes Reunited several years ago. He lives in a pretty little village near Longleat Estate. Although it is not far from Warminster the peaceful village, whose residents appear to be mostly senior citizens, is a world away. The visit of the mobile library provides these residents with a vital link to the outside world through loans of books and videos. We tagged along with our cousin as he went to change his books, while there we met some of the villagers and the librarian. I noted that, as well as providing resources, the library visit fulfils a social role by providing a place where villagers can meet and chat informally. The last time I was in a mobile library van was in the early 70s when, as Children's Librarian for the Randwick Library service I was responsible for the provision and organisation of library resources for young people. I worked from the main library at Maroubra Junction. My first connection with mobile libraries was in the late 1950s when, with my parents, I visited the Randwick Library Mobile Service that parked outside the Maroubra Junction Post Office each Saturday morning. Although they had little formal education my parents instilled in me a love of reading, I fondly remember our Saturday morning library visits to that crowded van where the librarian set up a card table on the footpath to record the loans and returns. I was introduced to the world of Noel Streatfeild and Ballet Shoes, Nancy Drew, Sue Barton, Trixie Belden and other characters from England and the US. One of my favourites was Dancing Star by Gladys Malvern, the story of the ballerina, Anna Pavlova. I guess that my library habit and future career choice was strongly influenced by my early visits to the mobile library at Maroubra that, just like the Wiltshire service, provided me with a link to the outside world through the wonderful world of books. Mr and Mr Geniaus have been off globetrotting for the last few weeks.Although it was not a genealogy field trip I managed to visit a few institutions, see some distant cousins and collect a few new resources on our round the world journey. Over the next few weeks I will blog about some of my experiences and finds. After our 20 hour journey from New York I was feeling a little flat on my return home yesterday. 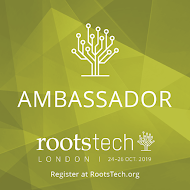 In between loads of washing I managed to log into my email where I found a great surprise.There were two emails with the subject line "RootsTech Proposal Accepted". My spirits immediately soared; I will be presenting in two sessions at Rootstech 2012 in Salt Lake City. I was absolutely stoked to get this news but now have tummy butterflies. 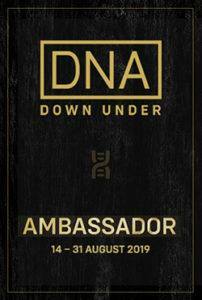 I don't think there will be many other Australian presenters at this international event so I feel a responsibility to do Australia proud. This will not be too difficult for the first session "Genealogy 2.0: international panelists discuss their use of social media to connect with cousins, collaborate on projects, discuss issues, market and promote genealogy services and perform acts of genealogical kindness" in which I will be joined by esteemed genealogists Amy Coffin (USA), Audrey Collins (UK) and Joan Miller (Canada). 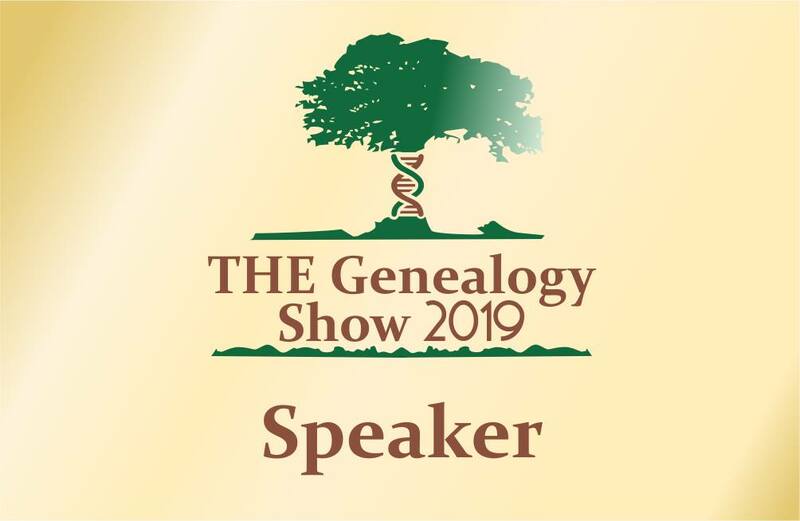 I was thrilled when these genealogists whom I met at Rootstech 2011 agreed to my proposal to form a panel to discuss Genealogy 2.0. We should have lots of fun collaborating with Web2.0 tools to prepare our presentation. Although my second gig "The Galaxy Girls –three genealogists and their Android tablets" will be a solo performance I have the support of two Australian genealogists, Shelley from Twigs of Yore and Tanya Honey from My Genealogy Adventure who also purchased Samsung Galaxy Tablets not long after I did. Via email, blog posts and more recently through a Huddle on Google+ Shelley, Tanya and I have been discussing our tablet use. I am indebted to The Galaxy Girls for agreeing to allow me to report on their tablet experiences. The generosity of the genealogy community is demonstrated by the willingness of these five genealogists to support my proposals for Rootstech 2012, I am most grateful to you. Congratulations to Michelle Nichols, Local Studies Librarian and the powers that be at Hawkesbury Library Service for sponsoring this project that will be so valuable to those of us with early connections in this area. Michelle posted the following on the AUS-NSW-HILLS-HAWKESBURY-HUNTER-VALLEY Rootsweb Mailing List. "I just wanted to inform the HHHV list of the exciting project that Hawkesbury Library has been working on over the past year. Windsor & Richmond Gazette 1888 - 1915? The content has been processed for Optical Character Recognition (OCR) with the content starting to appear on Trove and you will see the articles now being indexed with this message "This article is part way through the digitisation process. It will be available when the page it is part of passes the final quality control check. This is likely to be within the next 1-28 days." We hope to find the fund$ to digistise additional images of the Windsor & Richmond Gazette 1915 + in the not so distant future."